If you have a domain name that is hosted with godaddy.com , here is guide to help you to point your DNS (or Domain Name Server) to squarehook.com. Click on the "settings" tab found on both the upper-right hand corner and left side of your screen. Then click on the "Domains" tab on the blue menu found on the settings page. For this example I am going to point the domain squarehook.co that is being hosted by godaddy.com to my squarehook website. This is all you need to do on the squarehook end. The next steps will take place on godaddy.com for this example but it is basically the same process no matter who you have purchased your domain name from. Go to godaddy.com, logo into your account and find the domain that you want to point to your site. When you see the site you want to use, click on the green launch button to the right. This will open the Domain Details page. Here you will see some information about your domain and below that you will see three tabs. Click on the middle tab that says: "DNS Zone File". Now you will click on the "edit" button to make changes to your DNS. This will take you to the Zone File Editor page. Go to the table Titled: CNAME (Alias) and click on the "Quick Add" button below. This is where you will point your domain to your SquareHook site. Now you are almost complete. Now you just need to save the changes you have made in the Zone File Editor and now you will redirect and forward your domains. Once you have completed steps 1 and 2, your next step is to forward your domains to all land at the same place. While logged into your GoDaddy account, click on the link that takes you to "All Domains". Here you will see a list of your domains. Click on the check box at the left of the domain you want to use and in the menu above this list you will click on the "forward" button. In the "Forward To" area, select the subdomain you want your site root domain to point to. When you have completed this click on the "save" button and you are ready to go. Now when someone types in your site's root address, it will direct them to your subdomain. Note: This may take a while (up to 24hrs) to take affect so be patient if it doesn't work immediately. If you are still experiencing trouble after looking through this tutorial, you can post a new discussion to our User Voice or you can also contact our team of experts at www.squarehook.com/contact-us. 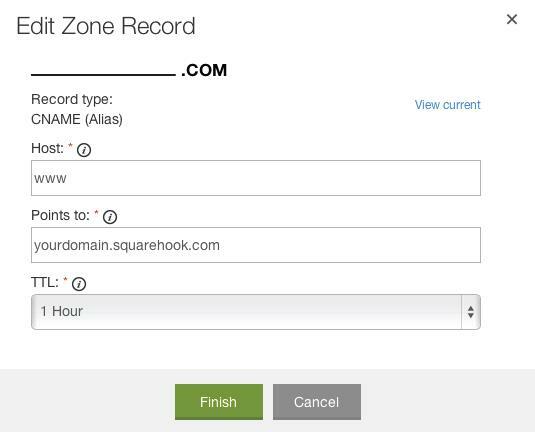 If you have a domain name that is hosted with bluehost.com, here is guide to help you to point your DNS (or Domain Name Server) to squarehook.com. For this example I am going to point the domain freebeagle.com that is being hosted by bluehost.com to my squarehook website. The next steps will take place on bluehost.com for this example but it is basically the same process no matter who you have purchased your domain name from. Go to bluehost.com, log into your account and click on the domains tab on the top menu. Then you will see a new menu below the main menu. You will click on the "Zone Editor" button on the far right. On this screen, you will see it prompts you to select the domain you want to modify. Now scroll down the page to the area that deals with the CNAME for your domain. Once you have completed steps 1 and 2, your next step is to forward your domains to all land at the same place. While you are still in the domains page, click on the "Redirect" button in the navigation of this page. 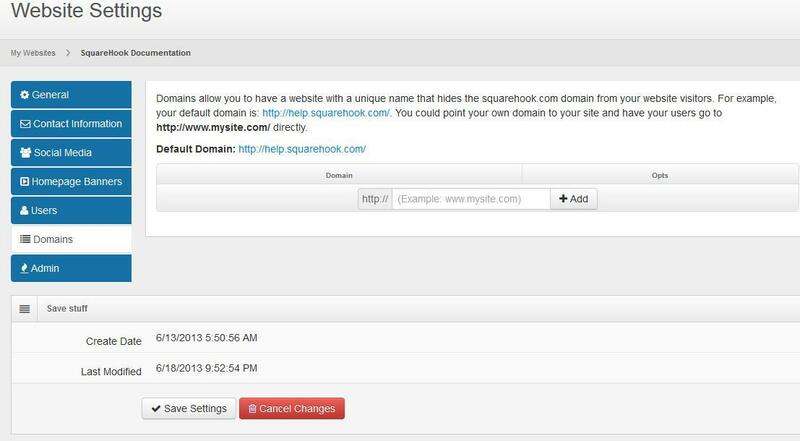 Now click on the dropdown menu and chose the domain you want to direct to your SquareHook site. Then on the "redirects to" field, type your domain with a www. in front of it. 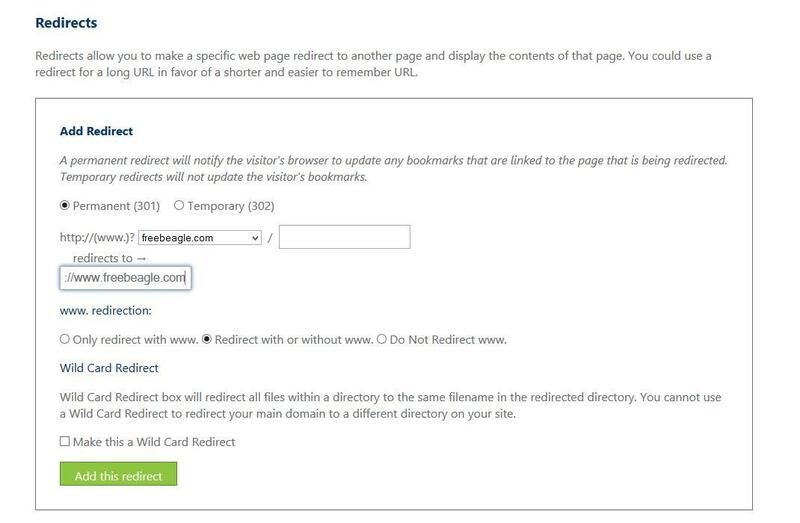 Now just click the "Add to redirect" green button below and your domain redirect will be complete!